If you would prefer to pay in person by check or cash, please see the front reception area. Please review our meal prices for the 2014 - 2015 school year. 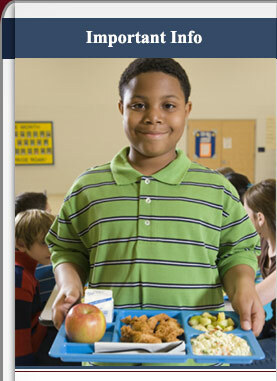 Welcome to our Child Nutrition Services page! Good nutrition is of utmost importance for our students. A healthy, well-balanced meal can help our students focus and work to their potential. Here you will find information about how to pay for your student's meals as well as some other helpful nutritional information. Daily Lunch Count Order: Lunch count is taken each day in your child's first period class by 8:45 a.m. There is no sign up sheet or binder. Please instruct your child to participate in the lunch count if they are buying school lunch for the day. You may pay online at the WAV site using your Family ID and PIN. To ensure you are able to receive meals, please make sure your account has sufficient funds to cover your family's daily meal count. You may deposit as much as you like into your school meals account, but your balance may not fall below -$3.25 to continue receiving the catered school meals. (For more details, see the Charge Policy). You may pay by check or cash at the front reception area. The receptionist on duty will issue a receipt and place your payment in a secured area. Child Nutrition processes check and cash payments once a week on Friday afternoon. If we have not received your funds by 12:00 noon on Friday of each week, we may not consider your payment until the next payment processing day (the following Friday). Therefore, we advise paying for the next week’s meals by Friday of each week. Students may charge meals if there is no money in their child nutrition account. The charge limit is $3.25 per family. Once the family's account has reached a balance of ($3.25), the student may no longer charge any meals. If a student is without the ability to charge a meal, we will offer the student an alternate meal. The charge policy is put in place for your convenience as well as to limit food waste. As in, if a student signs up for lunch that day, we put that meal into our lunch count, but when the student goes through the line and there are no funds to pay, we prefer not to throw the meal away. Thus, we accommodate with the ($3.25) charge policy. However, if the student attempts to exceed the charge limit, the student will receive the alternate meal, not the catered school meal. If a student has exhausted his/her charge privileges then the student must take care of the balance on his/her account before he/she can receive the catered school meal. The only option for the student who has exhausted charge privileges is to bring his/her school meals account to a positive balance such that their meal of choice will not bring their account to less than ($3.25), or be offered the alternate meal. Individuals who are deaf, hard of hearing, or have speech disabilities may contact USDA through the Federal Relay Service at (800) 877-8339 or (800) 845-6136 (Spanish). Por fax al (202) 690-7442 o por correo electrónico a program.intake@usda.gov. El USDA es un proveedor y empleador que ofrece igualdad de oportunidades."